Buy Competition is a Sin Bankster Silver Rounds | ?? 1盎司2014年竞争是罪|银行歹徒系列银圆 Competition is the backbone of every monetary system. But what happens when there is none? The Competition Is a Sin design shows a soulless, powerful tycoon revelling in his currency and the illusion of money he has created. By controlling money a very few wealthy individuals control the world. 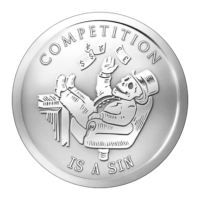 Competition is a Sin is the first in a mini-series of 4 coins about the rise and fall of the banksters and the first design clearly illustrates the rise of the banksters. The obverse features a design by Heidi Wastweet that shows a skeletonized tycoon in his fancy suit and top hat "kicking back" in his office chair, feet up on his no doubt expensive desk. He is throwing around some money in the typically careless fashion and the currency types are easily visible, the three most powerful, the dollar, the Yen, and the Pound. The words "Competition is a Sin" are engraved around the picture. The reverse shows the revised Silver Shield logo with the trivium in the centre encircled by the words "Silver Shield 1 Troy ounce 2014 999 Pure AG" surrounded by 47 bullets. This design shows the banksters bare and is the first in a four part miniseries. Each coin will only be available for a very limited time.